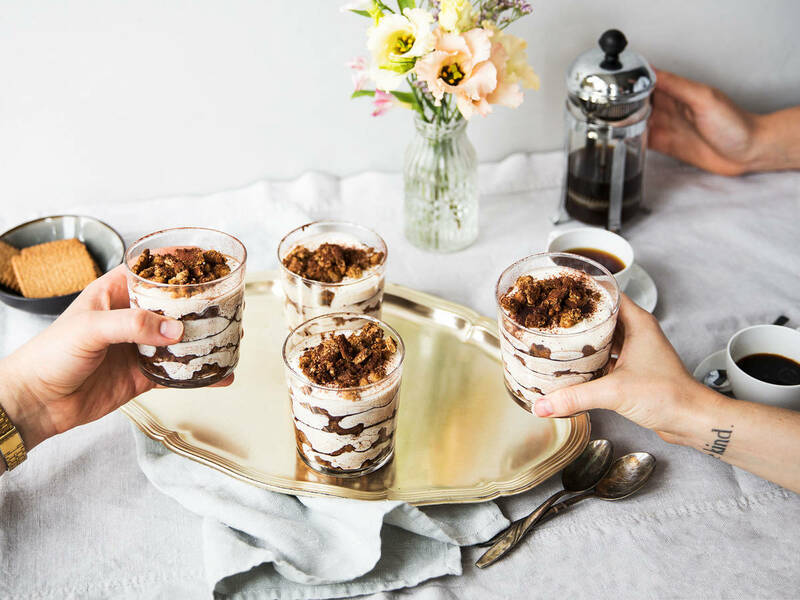 This week’s community pick, Emina Ibrahimović’s creamy coffee and cookie dessert, is certainly a special treat for all coffee lovers out there, but we think it can even convince non-coffee drinkers to convert–at least for one taste. What is a creamy coffee and cookie dessert? The idea is simple: Take all the ingredients for a cheesecake, plus some coffee-soaked cookies of your choice, whisk, crumble, chill, then layer into glasses. The result is an eye-pleaser that requires no baking and yields an intense coffee flavor and a creamy richness that we liken to a cross between cheesecake and velvety iced coffee. Now that the sunny weather has eased us into eating on our balconies or in the park, this dessert is energizing and cooling on a hot afternoon. The coffee-soaked yet crunchy cookies complement the smooth cream, and every spoonful is a pleasing synergy of textures. Plus, the distinct layers make it nice on the eyes, too. Our colleagues praised it as “extra rich” and “indulgent.” So, if you have a sweet tooth like most of us here at Kitchen Stories and you’re looking for a special treat, this is a great recipe for you. We achieved the perfect combination of textures by leaving the cookies quite coarse and not crumbling them too finely. We used butter cookies, but you can use any cookie you want from Italian amaretti to chocolate chip, gingerbread to oatmeal. Remember, the stronger you brew your coffee, the more intense the flavor will be. If you don’t like the flavor of coffee, try it with chocolate, almond, or sweetened coconut milk. Adults could even add a bit of rum to the coffee before soaking the cookies–how bad could that be? You’ve created a special recipe of your own? Why not share it with the Kitchen Stories team and our hungry community! Simply send your recipe to community@kitchenstories.com.